Pascal Siakam finished with 12 points and 10 rebounds and Serge Ibaka scored 18 as the Raptors won - despite missing Kawhi Leonard, who sat out to get some rest. The four-time All-Star Lowry also dished out eight assists after missing the last 10 of 11 games due to back and thigh problems. He played 32 minutes and shot four-of-10, going two-for-six from beyond the arc in front of a crowd of 19,800 at Scotiabank Arena. "Good to be out there with my guys," Lowry said. "It felt good to be able to help them get a win." 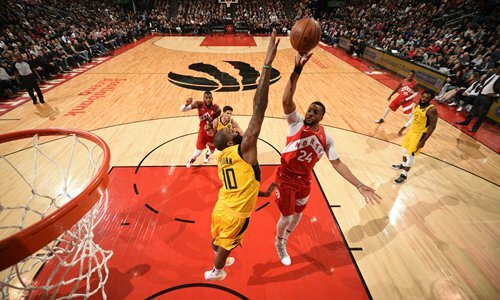 Danny Green scored 15 points and equaled his season high with five three-pointers as Toronto ­returned from a victory in Milwaukee on Saturday to win their fifth consecutive contest at home. The Raptors nailed 17 of 33 from three-point range, one shy of their season best. Bojan Bogdanovic scored 21 points, Domantas Sabonis had 16 points and 11 rebounds, and Victor Oladipo scored 16 points for Indiana, who have lost 14 of their last 16 against Toronto. The Pacers last win in Toronto was in 2013. Elsewhere, Bradley Beal scored 25 points as the Washington Wizards thumped the Oklahoma City Thunder 116-98 despite a triple-double from Russell Westbrook. Otto Porter had 20 points, six rebounds and five assists, Jeff Green scored 16 points and Tomas Satoransky added 15 for the Wizards in the win. Westbrook finished with 22 points, 15 rebounds and 13 assists for his 12th triple-­double of the season and the 116th of his career. Paul George scored 20 points and Jerami Grant added 17 for the Thunder, who had their modest three-game winning streak halted. In Minneapolis, the Timberwolves manhandled the Los Angeles Lakers 108-86 but it wasn't enough for head coach Tom Thibodeau to keep his job. Despite the team's fourth-largest margin of victory this season, Thibodeau was fired as he approached the halfway point of his third season in charge of the team.